Join this walking tour to visit at least 6 of your local guide's favourite eateries and watering holes. From artisan charcuteries to thirst-quenching craft beers, take delight in discovering the surrounding areas of the city's largest food market. You'll discover a different side of the city that you otherwise might miss out on. We focus on local, young entrepreneurs for our tasting spots and human scale environments for our in between walking segments. Over the years Montreal has held a reputation as a city that loves to eat, and eat well. 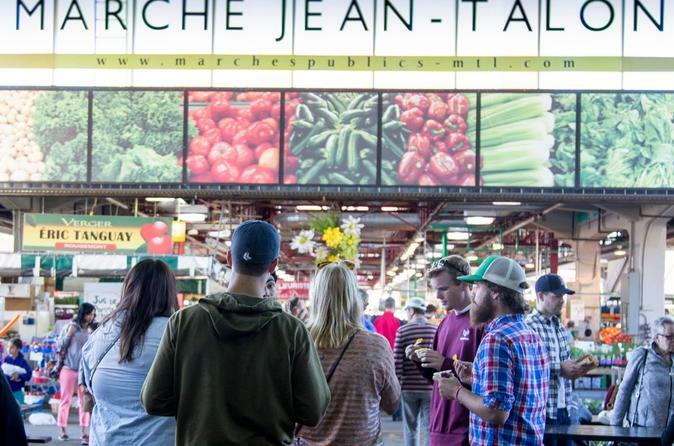 A trip to the Jean-Talon Market helps the outsider grasp the fact that farm-to-table is nothing new in town. On this food tour, you'll sample regional delicacies and meet the producers who take pride in the quality and distinction of their harvest. Strolling through the city streets, you'll gain a better understanding of why diversity is synonymous with Montreal. The Vietnamese neighbor the Italians and further east the Latinos share the streets with the Maghrebis. Sit down for a full-flavored tasting at the city’s favorite Salvadorian hole-in-the-wall. The Mile-Ex district is a peculiar part of town that has boomed in recent years, and it's here where young entrepreneurs are reshaping the local culinary scene. Savor the newest craft brews and learn about the progressive coffee renaissance one sip at a time. Conclude your tour at the doorstep of Little Italy. Enjoy some comfort food with your new friends and set off on your own adventure with a list of your guide's favorite local food spots.